The Real Meat Company 90% Beef is a high-priced dog food with exceptional quality. This product has no controversial ingredients, including zero artificial preservatives, colors and flavors - that’s fantastic. The food has a well-balanced amount of protein, fat and carbs and, moreover, excellent meat and fat quality. The Real Meat Company has a below-average number of recalls and was relatively transparent when answering our questions. Watchdog Labs highly recommends this product. The average dog food we reviewed has 39 total ingredients, with 1 controversial ingredient. This product has a fantastic 0 total controversial ingredients, that’s excellent. Beef lung is generally nutritious for dogs, providing a variety of nutrients like protein, vitamin C, iron and minerals. It's a high-quality dog food ingredient. Ground bone is generally a healthy dog food ingredient because it offers a natural source of calcium and other minerals to dogs. Vegetable Glycerin is a natural sweetener and also preserves moisture in dog food. It's a generally acceptable dog food ingredient. The Real Meat Company 90% Beef dog food doesn’t include a single controversial ingredient, well done. This dog food is made in the USA, excellent. This product uses clearly named proteins such as Beef, Beef Lung and Beef Liver. This is excellent because it shows us exactly which animal these ingredients come from. There are no added oils, so the food’s fat comes from the meat ingredients. Zero artificial preservatives are used in this food. That’s outstanding, especially for a dry food, which doesn’t have the preservation benefit of a can. The food is air-dried to remove moisture and preserve it better. By the way: It’s good to know that ‍not all artificial preservatives are bad - as they’re designed to avoid spoiled food. However, we consider 11 artificial preservatives controversial because of their potential link to cancer and other serious health conditions. The Real Meat Company 90% Beef also doesn’t use any artificial colors - that’s an awesome choice, because your dog doesn’t care about the color of its food. No artificial flavors, either, excellent! This food checks off all three “no artificial” checks, that’s a big plus. 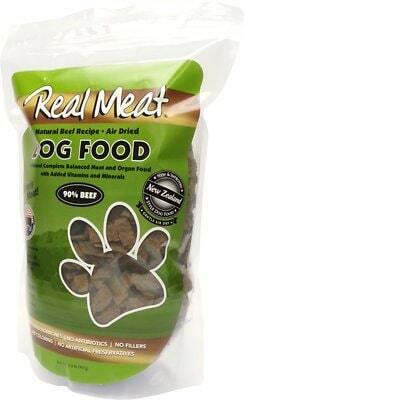 We love to see a dog food that goes the extra mile to avoid potentially unhealthy ingredients. The Real Meat company initially responded very quick, taking only two days to respond. Their response did not answer a couple of the questions but said there would be a follow-up email to answer the remaining questions. That email was never received. We do not do AAFCO feeding trials because they are inhumane. This reason was cited by several other companies as well. Yes they can by appointment only. We found it to be rare for a company to be open to a facility visit. Yes we do own our own facility as well as using another facility. ‍Whenever a company uses a facility they do not own it is referred to as a co-packer. Its a good sign of transparency when a company shares the name of this co-packer so that we know exactly who is making the food. Real Meat did not share the name of this other facility.